Feel an immense pride and satisfaction in the beauty and aesthetic appeal of your home when you invest in luxury vinyl flooring from our professionals. An extremely versatile and elegant flooring material, vinyl is a great option for any room due to its natural resistance to moisture, durability, and wide selection of design options. Rely on our team of flooring professionals today to guide you through selecting your ideal luxury vinyl tile or plank flooring. We offer countless decorating options for your home that cater to your lifestyle needs. Feel free to ask any of the associates at our local shop to show you samples of the different styles we have available. When you are searching for the latest vinyl flooring, our flooring company is here to help. When you schedule your install with us we send a team of highly skilled installation experts to your home to perform a streamlined vinyl flooring installation in any room. They provide unsurpassed artistry and professionalism with every project in order to make your floors look as close to perfect as possible. Each worker is committed to providing the highest quality work in a timely manner with exceptional attention to detail. Your satisfaction is always their utmost priority. Combine the sophisticated look of tile with the durability and resilience of vinyl. At our flooring store, our technicians offer luxury vinyl tile flooring that meets your every need in both design and functionality. We utilized the latest embossing techniques so that your luxury vinyl flooring may imitate other style options in a stunning, realistic manner. Furthermore, vinyl has a hardwearing construction that is unparalleled in the flooring industry. It can withstand the heavy foot traffic of children and pets while resisting all types of stains and scuffmarks. This results in a sleek, durable floor that you will enjoy for years to come. 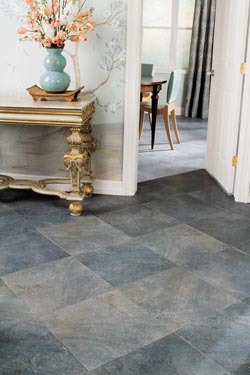 Not only does luxury vinyl tile flooring bring a significant aesthetic appeal to every room in your home, but it also provides a level of sturdiness that you cannot find with most other types of flooring. Its slip-resistant surface makes it easy for your elderly family members, young children, and houseguests to walk across it safely without any fear of slipping or falling. If you love the appearance of hardwood, but desire a material with easier maintenance, then look no further than vinyl plank flooring from our associates. We help you choose a flooring style that looks exactly like the natural beauty of wood that you want in your house. Whether you are looking for a modern style or a classic appearance, we have the inventory you need to refashion your home. To ensure your convenience, vinyl plank flooring has one of the simplest maintenance plans flooring on the market. You only have to touch up your floors with a quick sweeping or mopping. Contact us today for luxury vinyl flooring that updates your home. We proudly serve Allen, Wylie, Princeton, Farmersville, and Fairview, Texas, plus the surrounding areas.